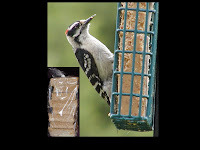 This is the best suet your likely to buy, anywhere. The recipe is simply, it's half double rendered beef kidney suet and half peanut butter. There are no fillers of any kind, no corn, no millet, nothing. And simply put birds love it. Once you and your birds try this you'll never go back to the commercial stuff. The Bird Garden suet is better than any premium brand suet and is priced lower than the chain store brands. I guarantee it's the best you've ever used. Sorry, it's only available at our 2 locations. Made of heavy duty 1 inch tubing the hanger comes with 2 double hangers(each hanger adds 1 foot to the post for a total of 10 ft), 2 four foot sections of post, and a 32 inch 1 1/4 inch ground spike. We make these hangers ourselves, the steel is extra heavy, 1/10 inch post and the hangers are full 1/2 round. Most similar hangers are lighter weight, but I'm not the best welder and need to use heavier steel to prevent burning through. My loss is your gain. Even with the extra heavy steel, I had to repair one (no charge) that got bent in the middle, presumably by a bear near Fundy National Park. 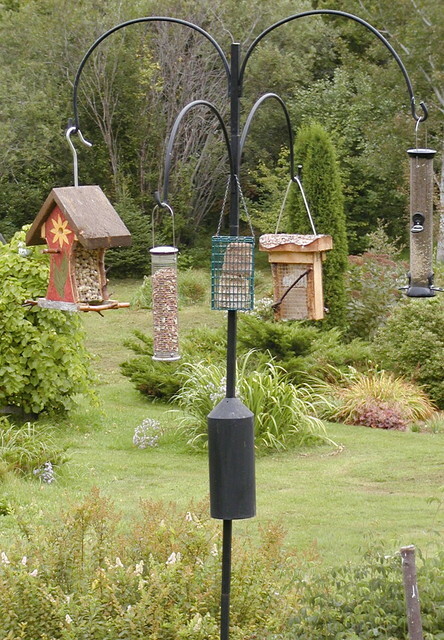 Nothing keeps squirrels off your feeders like a 4-10. Shown with the Torpedo Baffle, not included. If you have any bird houses that are in great shape in every way.... except a squirrel or woodpecker enlarged the hole, this is a great way to "renew the hole" and make sure those pesky Starlings aren't going to use the house. It also makes a great predator guard on any house. 1.5 inch hole. These small hangers are perfect for hummingbird feeders and certain small seed feeders. 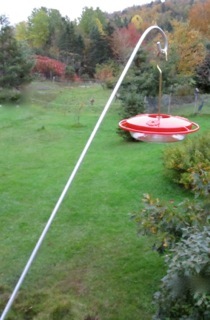 They're high enough to see the feeder over the railing, far enough out so "stuff" doesn't fall on your deck, but you can still reach the feeder. You need to drill a quarter inch hole in a post or rail, (we found it makes less of a mark on your deck than the hangers that attach with 2 or 3 screws. If you want to move it, simply plug the hole with a quarter inch dowel and wood glue then sand it smooth). They never rust or need re-painting. 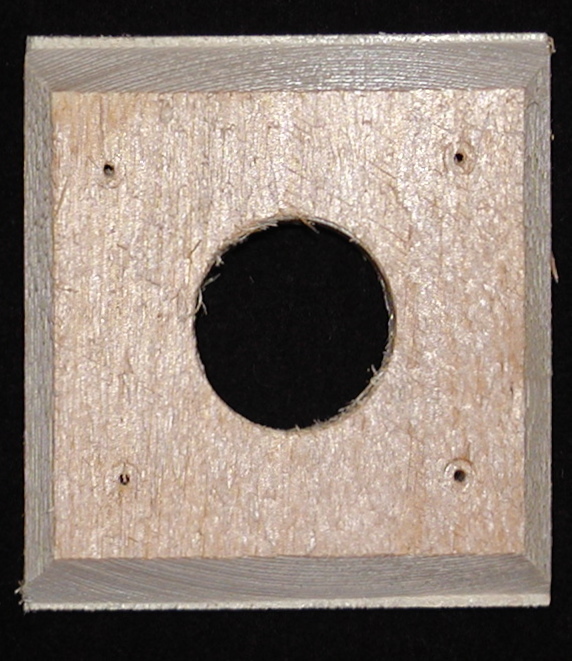 If you have any bird houses that are in great shape in every way.... except a squirrel or woodpecker enlarged the hole, this is a great way to "renew the hole" and make sure those pesky Starlings aren't going to use the house. It also makes a great predator guard on any house. 1.5 inch hole. 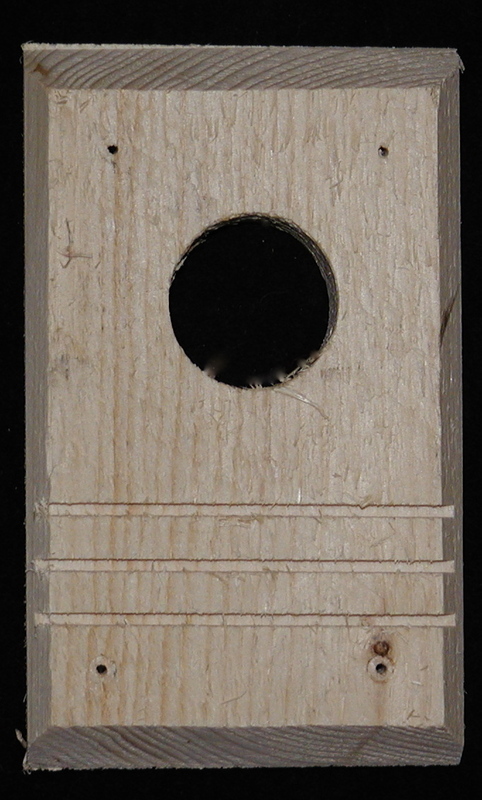 Similar to the free hole, this one has extended grips below the hole.